As director of digital media, Tom Clifford is responsible for all digital initiatives, including the presentation of news and advertising on the website, mobile app development, social media and video/multimedia production. He started in Charleston in June 2010. 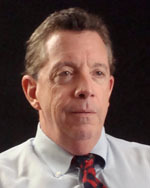 Clifford was named executive news director in February 2011. Clifford previously was editor for digital delivery at FLORIDA TODAY, overseeing the newspaper's print production and website, as well as managing editor for Custom Publishing, leading the reporting, editing and production of 12 weekly and bi-weekly publications, and parenting and home design magazines.